You lose count of the number of times you hear documentaries trashed. The argument is as old as the documentary, and it goes like this. Docs manipulate reality, over-relying on effects such as music. They aren't really journalistic at all. Maybe one should think of them as drama without actors, cheaply made and with few pretensions to seriousness. Shamelessly, they pander to our worst voyeuristic impulses. Under the guise of telling the truth, docs entertain us with lies. 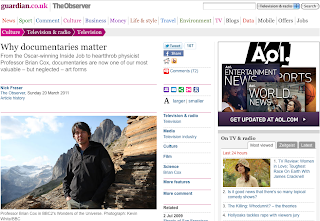 It would be more accurate to say that documentaries are among the most valuable, neglected cultural forms of our time. They aren't all good, to be sure, but the best are unusual, persuasive, seductive. And their success has something to do with the way they are taken for granted, casually watched. Few old things have flourished in the cultural chaos of this century, but docs have steadily consolidated their hold on a small portion of the contemporary consciousness. Film stars want to make or sponsor them. Sometimes, if you squint hard enough, they really do seem like the new rock'n'roll. Criticism of documentaries comes in waves. A few years ago, spotting fakery in docs was in vogue, though it seemed that most docs were scrupulously, often tediously, unfaked. Now the critics have latched on to the vulgarity of peak-time docs. Channel 4 has been slated for My Big Fat Gypsy Wedding. Was the series set up in some respects? Did it end by stereotyping Romanies under the guise of complaining about their stereotyping? The critics also complained about the superficiality of Niall Ferguson, whose Channel 4 series, Civilization, runs us through the west and its discontents. But the most acrimonious debate surrounded the attempts of physicist, and heartthrob, Professor Brian Cox to explain the secrets of the universe in Wonders of the Universe. Master of the Queen's Music Sir Peter Maxwell Davies complained about the use of "Muzak" in the BBC2 series. "Viewers have not tuned in to listen to a musical performance," he declared. To read the rest, visit The Guardian site.